Muhammad ibn Abdallah was born into the Bani Hashim branch of the powerful Quraysh tribe, which had historically ruled the pagan city of Mecca (Makkah). Mecca was an important city even in those days, pilgrims from all over Arabia made pilgrimage to Mecca to circumambulate the Kaaba and kiss the Black Stone, which was then consecrated to the moon-god Hubal. Mohammed's father died before Mohammed was born. Mohammed was brought up first by his mother, Amina, then by his Grandfather, Abd al-Muttalib, later by his uncle, Abu Talib. Throughout his childhood he was attracted to the world of the spirit. He was drawn to solitary contemplation, and he often experienced visions, some violent and disturbing. Some modern scholars have theorized that he was epileptic. Mohammed's uncle, Abu Talib, was a textile merchant, and the young Mohammed accompanied his caravans to Syria, Yemen, Egypt and Mesopotamia. During the caravans, Mohammed often conversed with the priests, rabbis and monks he encountered at the various trading posts, accumulating knowledge about the various forms of Judaism and Christianity extant at the time. At the age of twenty-five, he married a wealthy forty-year-old widow named Khadija. She gave him six children, two boys and four girls, only one of whom, his daughter Fatima, survived him. Khadija's cousin was a religious scholar named Waraqa, who was the first to have translated parts of the Old and New Testaments into Arabic. Mohammed frequently sought out Waraqa's company and conversation. 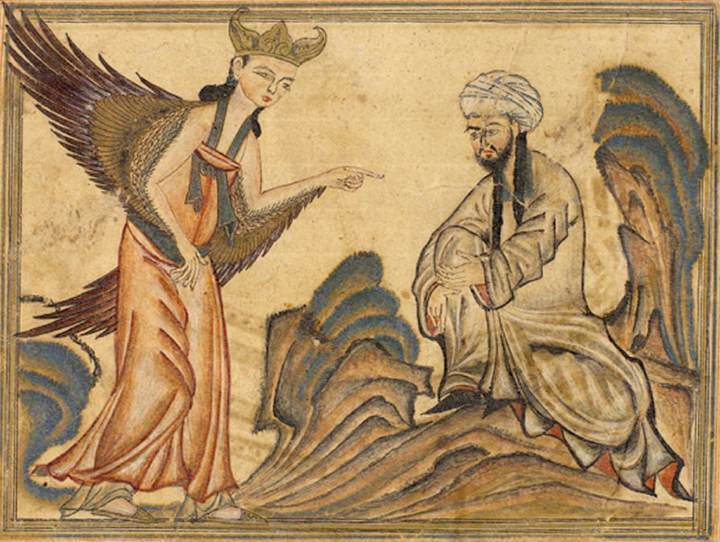 The vision had passed, and Mohammed was left questioning his sanity. He considered throwing himself over a cliff, but as he emerged from the cave into the night air, the Voice rang out again: “O Mohammed! You are Allah's messenger, and I am Gabriel!” He looked up and beheld the Angel suspended in the middle of the night sky, transfixing him with his piercing, shining eyes (later, astronomers determined that the Moon and the planet Venus had been in close conjunction at that time). In further revelations, Mohammed's mission in life was clarified: he had been called upon to preach to the world the true Faith of the One God. At first he was reticent– he had doubts about the authenticity or source of his vision. But Khadija encouraged him, and soon his calling was confirmed by additional visions which revealed the terrible doom which lay in store for sinners and infidels. He began to preach to a small group of close associates. Khadija and Waraqa were his first disciples, then came his friend and business associate Abu Bakr, `Ali, the son of Abu Talib, and Mohammed's slave Zayd ibn-Thabit. Muslims do not consider Islam to be a new religion. Islam was intended to be a reform of the ancient religion of Abraham, of which Judaism and Christianity are branches. Islam confirms the truth of the Torah and the Gospels, but purports to clarify them, to correct a number of errors of interpretation, and to purify them from the accretions of rabbinical and priestly sophistries. The major reforms of Islam include the rejection of polytheism (including trinitarianism), idolatry, and priestcraft. The “five pillars” of Islam are : 1. Shahadah, Profession of Faith; 2. Salat, Prayer (5 times a day); 3. Zakat, Alms giving; 4. Sawm, Fasting (during the holy month of Ramadhan); and 5. Hajj, Pilgrimage to Mecca (at least once in the Muslim's lifetime). Muslims revere Isa (Jesus) as a great prophet, but not as God incarnated as do the Christians. Muslims also reject the belief that Isa suffered crucifixion, but assert that an accomplice was crucified in his place. An empty tomb for Isa lies next to that of Mohammed at Madina, where they believe he will be buried after his return to battle the forces of evil during the last days. Mohammed's circle gradually grew wider, including the wealthy and influential merchant `Uthman ibn-Affan of the Umayyads, the Quraysh aristocracy, and the warrior prince `Umar ibn-Khattab. Mohammed began to feel more confident in his role as last of the Prophets. His visions continued, and included one (the Mi`raj) in which he was carried to the Temple Mount at Jerusalem on the back of a winged horse with a human face. There he entered the Holy of Holies and prayed alongside Ibrahim (Abraham), Musa (Moses) and Isa. He then ascended a celestial ladder to paradise and was brought before Allah Himself, who embraced him and spoke to him (Islamic theologians still dispute what Allah may have told him). He then descended the ladder to the Temple Mount, where the winged steed returned him to the house in Mecca where he was staying. Eventually, he resolved to convert the pagans of Mecca to the One True Faith. The Umayyads, the aristocratic branch of the Quraysh, refused to recognize Mohammed's authority, and he was forced to flee Mecca to the city of Yathrib (now called Madinat an-Nabi-Allah, the City of the Prophet of God, or “Madinah” for short) under threat of murder. Mohammed's flight from Mecca, called the Hijra, occurred in 622 e.v., and marked the beginning of the great diffusion of the Islamic Faith. The Hijra serves as the point of beginning of the Islamic calendar. Yathrib was a town founded by Jews, and Mohammed, while still in Mecca, had convinced a large number of them that he was the promised Messiah. These converts had prepared the way for him, and he entered Yathrib like a king. Khadija had died before the Hijra, and Mohammed married `A'ishah, the daughter of his close friend Abu Bakr. His preachings began to take on a gentler tone, emphasizing the rewards in store for the faithful, and how the faithful should conduct their lives. He preached of the rights of women and of slaves, and preached against compulsion in matters of religion. He won many additional converts in Yathrib, and, with his eye still on Mecca, began raiding Meccan caravans to accumulate wealth. The Umayyads, of course, retaliated with sporadic attacks upon Yathrib. As his followers were increasingly required to kill and die for the faith, his preachings took on an increasingly belligerent tone; he proclaimed that idolatry was worse than war, and that the quickest way to Paradise was to die for the Faith in battle. When he had accumulated enough support and resources, he returned to the city of his birth and conquered it. He reconsecrated the Kaaba to the service of the One True God, and began laying plans for conquering the world. He died peacefully in `A'ishah's hut near the Mosque in Madinah, and was buried where he died. Although he did not live to see the Faith progress beyond the Arabian peninsula, his successors pushed it to the ends of the Earth. Within three generations after Mohammed's death, they had conquered nearly all the lands from Spain to the frontiers of China. Mohammed had many children, but none of his sons and only one daughter, Fatima, survived him. According to tradition, only a male child is suitable for heirship, so Mohammed left no clear successor to his religious authority. His first successor, or Caliph (Khalifa), the saintly Abu Bakr, was elected by a group of Mohammed's closest followers (in the absence of `Ali). Under Abu Bakr, the Islamic empire grew to include Yemen, Oman, Bahrain and most of Palestine. Mohammed could not read or write, but his followers recorded his teachings on the materials that were available. After his death, Abu Bakr commanded Zayd to gather together Mohammed's revealed teachings, recorded over a twenty-three year period from 609 e.v. to 632 e.v., into a single volume. This volume became the Qur'an, which constitutes the holy book of Islam. The Qur'an is organized into 114 Chapters in which each Chapter, called a Surah (“degree”), represents one (or more) of Mohammed's revelations; although they are not arranged in chronological order. 93 of the Surahs were received during the 13 years prior to the Hijra at Mecca, the remaining 21 were received later at Madinah. Abu Bakr died in 634 e.v. and was followed by the heroic, tyrannical `Umar, who conquered Syria, Iraq, Egypt, Persia and Jerusalem. `Umar was murdered in 644 e.v. On his death bed, he appointed a committee of six Quraysh to debate his succession between `Ali and `Uthman, and `Uthman, at age 70, was chosen. `Uthman's generals added a considerable amount of property to the empire, including Cyprus, Rhodes, Libya, Afghanistan, Turkestan and Khorasan. Nevertheless, `Uthman proved to be a feeble, corrupt and incompetent ruler. He placed members of his own Umayyad tribe in all the positions of high authority. He revised the Qur'an (deleting all the negative references to the Umayyads) and had all copies of the previous version destroyed. Many objected to `Uthman's revision, but it nevertheless became the standard and is the version in use today. `Uthman became quite unpopular, and he was murdered by insurgents lead by the son of Abu Bakr, Muhammad ibn Abu Bakr, in 656 e.v. The Prophet's cousin, son-in-law, and adopted son, Hadrat `Ali ibn-Abu Talib, was elected the fourth Caliph. `Ali had married Fatima and had two sons by her, Hasan and Husayn. `Ali had been an extremely valiant warrior in Mohammed's service, earning the epithet “The Lion of God,” but he inherited from `Uthman an empire in disarray; and his reign as Caliph was plagued by treachery and conspiracy. `Ali's election was disputed by a member of `Uthman's Umayyad elite, Mu`awiyah, governor of Syria. Mu`awiyah contended that `Ali bore some of the guilt for `Uthman's murder by failing to punish Muhammad ibn Abu Bakr. In defiance of `Ali, Mu`awiyah proclaimed himself Caliph at Damascus in 660 e.v. `Ali was powerless to stop him, and was assassinated in 661 e.v. `Ali's son Hasan claimed his successorship, but was convinced by Mu`awiyah to abdicate. Mu`awiyah promised that the Caliphate would return to the house of Mohammed upon his death; but after Hasan's death, he appointed Yazid, his own son, to be his successor. Husayn attempted a revolution, but was defeated and beheaded by Yazid. The house of Mohammed had bestowed the Caliphate upon the Umayyads, and a legacy of turmoil upon Islam. `Ali's ardent followers, who became known as the Shi`a (adherents), believed that `Ali had been designated by Mohammed himself as his true successor, that `Ali's sons bore the Prophet's virtue through his daughter Fatima; and, therefore, that `Ali's dynasty had the true divine sanction to rule over Islam. They accepted the authority of the first four Caliphs, but rejected that of Mu`awiyah and all those who followed him. The Shi`a refer to the descendants of `Ali as Imams (examples), and reject the religious authority of all the Caliphs who succeeded `Ali. The “orthodox” Muslims, who recognized the authority of Mu`awiyah and the Caliphs who followed him, became known as the Sunni (traditionists). The Shi`a have always been at odds with the Sunni, but they have also been at odds with themselves. The sixth Shi`ite Imam, Jafar, had two sons, Isma`il and Musa. The eldest, Isma`il, had been chosen as the next Imam but did not survive his father. Jafar designated his younger son Musa as the next Imam; but Isma`il had already had his own son, Mohammad ibn Isma`il, and had proclaimed him to be the next Imam. This, of course, resulted in another schism. The followers of Isma`il are known as Isma`ilis or “Sevener” Shi`ites. Musa's decendants ruled over “orthodox” Shi`ism. Several generations later, in the year 878 e.v., the twelfth Imam of Musa's line, Mohammed ibn Hasan, decended the stairs into the cellar of the Great Mosque of Samarra and never returned. The twelfth Imam had vanished without a trace from the world at the age of seven, leaving no successor. “Orthodox” Shi`ism is therefore sometimes referred to as “Twelver” Shi`ism. The Twelvers believe that the twelfth Imam was taken by God into temporary hiding from the world, and that he will return some day as the Mahdi, or Messiah. It is this branch of Shi`ite Islam which rules modern Iran. The Isma`ili branch of Shi`ite Islam gave birth to the ruthless, mystical Qarmatian movement, whose secret doctrines were revealed through a series of initiations given in seven degrees. The Qarmatians founded the Fatimid dynasty of Egypt, which in turn generated the secretive sect of Lebanon called Druses as well as the notorious Assassins of Lebanon and Northern Iran, who were alleged by some historians to have influenced the Knights Templar. Islam contains another tradition worth mentioning here, that of the Islamic mystics known as Sufis or Dervishes. Sufism is nearly as old as Islam itself, and, though primarily centered in Persia, the heart of Shi`ism, crosses over all schismatic boundaries. The Sufis emphasize personal mystical experience over temporal power, and can in this way be considered the “Islamic Gnostics.” They are generally detested by both the Shi`a and Sunni orthodoxies. Some scholars believe that Sufism developed through the assimilation into Islam of elements of Christianity and Neoplatonism, but such hypotheses are difficult to prove. Sufism has it's own list of philosopher-poet-saints apart from the Caliphs and Imams, some of the greatest of which are Abu Yazid (“Bayazid,” died 909 e.v. ), Rabi'a al Adawiya (717-801 e.v. ), Husayn ibn-Mansur al-Hallaj (d. 922 e.v. ), Abu-Hamid Mohammed al-Ghazzali (1058-1111 e.v. ), Fariduddin Attar (1110-1220 e.v. ), Muhiyuddin Muhammad ibn-`Ali ibn-al-`Arabi (b. 1165 e.v.) and Maulana Jalaluddin Rumi (1207-1273 e.v. ).